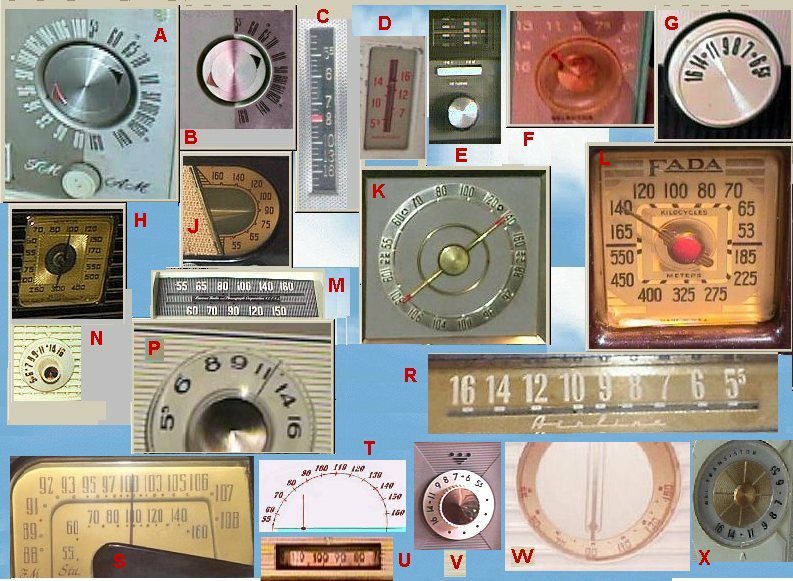 Here is a study of various styles of dials on radios. Of course what follows is my humble opinion, YMMV. Certian layouts of dial markings strike me as "backwards". Examples in the above picture are figures F, G, L, R, U, V and X. These have the frequency markings in a decending to the right mode. What seems more "natural" to me is to have the frequencies ascend to the right, as in figures H, M, N, P, S, T and W. I haven't decided in the case of vertical dials, such as figures A, B, C, D, E, and J. Complements of "correct" and "backwards" dials could be paired as follows: N and G, H and L, P and F, and slide rule dials M and R. Complements of dials in the vertical direction would be B and J, and C and D.
Of course, it all depends on what way you need twist the shaft of the tuning capacitor to get decreasing capacitance (thus increasing frequency). For a cap that you need twist clockwise to increase received frequency, I'd pick a dial like that in Figures P and not G or V. For a cap you need twist counterclocwise to increase frequency, I'd pick a dial like figure N and not F or X, though J is acceptable because it is vertical. Also W is also good, if you have to have a moving pointer, arrange the frequencies below the dial. Dial X got it backwards. In the case of slide rule dials, it depends how the dial cord is strung. The most common are M and R, with moving pointer and stationary freqs. My perferred one is M and not R. A fairly rare dial is the scrolling slide rule: stationary pointer and moving frequencies, like figures E and U. U is actually a thumbwheel, but could be considered as scrolling frequencies. The dial in figure U is backwards, though. One problem that shows up in dual band radios with circular dials such as fig K is that when one of the band's frequencies are "correct", the other band is "backwards". However, a nice solution to this problem is to mark the calibrations and dial like figure A. As I haven't selected a preference for vertical dials, this is a nice method. Fig A shows a set of moving pointers and stationary frequencies. The reverse, moving freqs and stationary pointers would also work for me. Another solution is shown in fig S, just put both bands on the same side of the shaft of the dial. Some single band radios show two calibrations, one set is frequencies, the other wavelengths. See figures H (correct), and L (backwards). 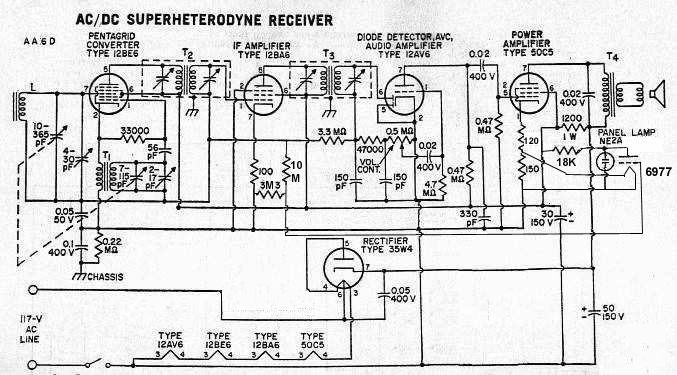 To the left is a drawing of a style of a dualband dial that I've never seen on a real radio (except for a Silvertone). A combination of styles. Stationary pointer on top, stationary frequencies on the bottom, moving frequencies on top, moving pointer on bottom. This way, the frequency markings are both ascending to the right. 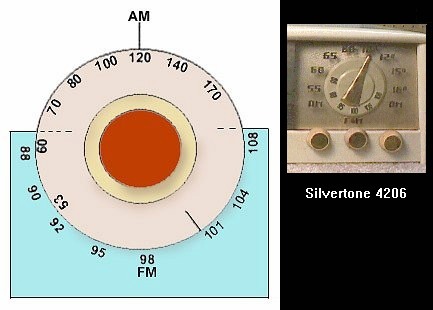 The Silvertone has the pointers and ascending frequency markings the other way around. The AM frequency numbers on the stationary background are the usual AM calibrations 55 thru 160. And the FM calibrations on the moving dial range from 88 to 108. Every dial except T above has the frequencies at the high end scrunched up together. Figure T is a linear spacing marking, mainly by making the tuning shaft off center of the dial. 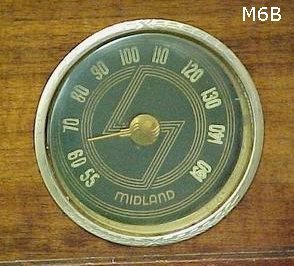 Here is another dial with almost linear frequency spacing, on a Midland M6B. This set is tuned via variable inductances instead of the more usual variable capacitences. Ferrite slugs slide inside coil forms with the coils wound on them in a controlled pattern. This pattern yields linear frequency change vs. slug position. 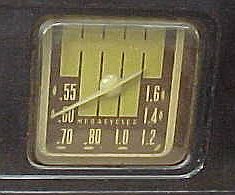 This dial is the only one I've seen with the standard broadcast frequencies calibrated in MHz, not KHz, X10 KHz or X100 KHz.
. 5 to 1. 6 MHz. This set (I was outbid) is a Stromberg Carlson 561. A clock radio dial I've never seen. Here the frequency dial calibrations also double as time markings on the clock face. 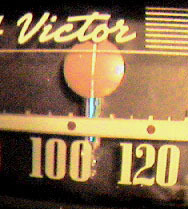 A mechanically offset radio dial pointer tunes the radio. A small pulley behind the dial face connected via dial cord would move the pointer and tuning cap. The pointer would sweep across the numbers in the usual nonlinear fashion most radio dials have. A 24 hour dial is chosen so the radio pointer can sweep 180 degrees from 5.4 to 16. 3 or so. A 12 hour dial won't show freqs above 12 anyway and wouldn't provide a reasonable nonlinear pattern anyhow. The usual Telechron clock drive made for 24 hour clocks would drive the clock hands. The below is an RCA 15X radio that I added a small indicator tube to. The 6977 is a small submini indicator tube. Glows cyan, varies in brightness. Here it gets darker on a stronger station. The filament power is taken from the cathode circuit of the 50C5 or 50L6 output tube. The 6977 grid is biased off the AVC line, in this example a 10 meg and 3.3 meg resistors are used as a voltage divider. The high values are to avoid loading the AVC line too much. 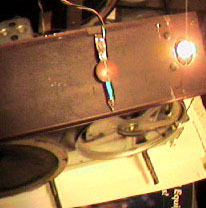 A small neon bulb acts as a simple voltage regulator/ dropper for the plate of the 6977.